The British Gazette » The EU Referendum: Pacing oneself. 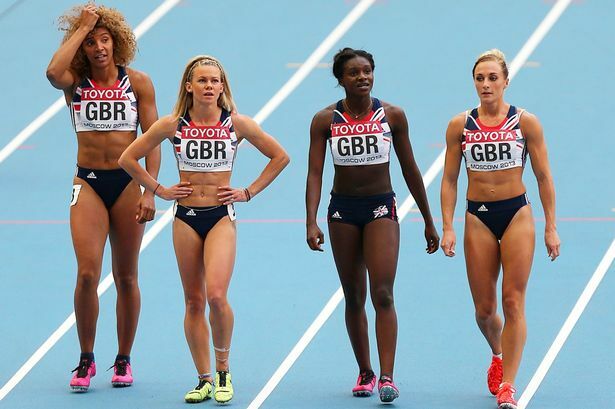 Above (left to right) Miss Ashleigh Nelson, Miss Hayley Jones, Miss Dina Asher-Smith and Miss Annabelle Lewis – Britain’s 4 × 100 metres lady’s relay team at the 2013 World Championships in Athletics held at the Luzhniki Stadium in Moscow on 18th August that year where they won a bronze medal. A long time ago now – and a couple of stone lighter! – your Editor, Dear Reader, competed for his school house team in what was then the 100 yards (that is 91.44 metres Derek). This was because at that time, I was rather good at it! It was a large school and there were two boys who could sprint that distance faster than all the other boys. There was your Editor and another boy, who shall remain nameless as we have no idea where he lives and therefore cannot obtain his permission to be quoted. Back in 1985, 13 years after I had left school in 1972 another “old boy” suggested that I should try jogging. He said it would be good for me. Thus it was I donned a pair of cheap running shoes and wearing summer clothes in autumn I set off. Turning left out of our drive, I ran up Kingswood Gardens to the main road at the top, turned right and set off running along the pavement of that main road, called Street Lane. As I ran past Bideford Avenue, like the man (Comrade Corbyn’s PR consultant? – Ed) who jumped off the top of the Empire State building, who after passing the 60th floor on his rapid descent towards West 33rd Street, thought, “so far so good” I thought everything was going swimmingly. I thought that after I passed Chelwood Drive. When I reached High Moor Avenue however things suddenly changed and I ran completely out of steam! It was a combined case of too many expense account lunches and too few exercise sessions. I turned around and walked back home. My mistake of course – which our four young lady athletes would of course point out – was that I set off far too quickly. These young ladies know that it is very important to pace oneself. If you are going to run a marathon, you do not set off at the same pace were you to run 109 yards, 1 foot and 1 inch! (Sorry Derek! 100 metres). These young ladies would also point out the need for training! As it is with the 4 × 109 yard + lady’s relay race, so it is with the EU referendum. There is in fact another notable commonality between the race our young ladies took part in and the one we are in! We know where the finish line is! Our race will end at 10:00PM British Summer Time on Thursday 4th May, 2017 when the polls close. We know this to be the case as Germany’s Chancellor, Frau Doktor Angela Merkel has decided so! And, being a “Good European” our Dearly Beloved Prime Minister, Mr Chameleon will do as he has been told! (By “She Who Must Be Obeyed! – Ed). In our article of the 22nd (http://www.british-gazette.co.uk/2015/11/22/message-to-mr-cummings-of-leave-eu-stop-xxxxing-around-and-get-it-right/) we drew the Reader’s attention to the problems associated with treaty change. However, Dr. Nicolai von Ondarza, Deputy Head of Research Division at the Stiftung Wissenschaft und Politik (German Institute for International and Security Affairs) at Ludwigkirchplatz 3-4, 10719 Berlin points out that an agreement could be concluded by May 2017 via a process similar to Denmark’s “opt outs” at the time of the Maastricht Treaty. Herewith a link to the SWP website and an English language .PDF that can be downloaded. It makes for interesting and informed reading! A MUST READ for all Eurorealists!